In 2016 I embarked on an inner journey of exploration to reclaim my authentic self. I wanted to recover the me that was present before I was conditioned to think differently about myself and had limitations and expectations put on me. I used the powerful and intuitive JourneyCircles™ Process to do this. Mixed media techniques, found images and torn paper collage allowed me to visualize, re-story and restore how I viewed my inner world as I began to claim my authentic truth. It is so powerful to create in ways that allow you to retell root stories. It is empowering to release stories that no longer serve your highest good or align with who you are now. Creating makes space for new stories about who you are becoming. Breaking free from old beliefs and healing the past is a gift creative depth work brings to you. The restorative powers of creativity and art making are truly amazing. As you learn to use image as the language of the soul you begin to give yourself the ability to voice inner experiences that before you had no way of talking about. I’m an introvert. Perhaps you are too, so you might relate to this part of my experience. As a child I was very sensitive, spiritual and quiet. Never quite at home in the world, but very at home in my imaginal world. I could play for hours by myself with very few toys or props, my vivid imagination could easily fill in the gaps. It seemed as if there were entire universes in my head and I could move freely from one to another. Sometimes I would tell my mother to send friends away who came knocking at the door to see if I wanted to come out and play with them. That’s how much I enjoyed my own inner worlds. It also speaks to how difficult it was to share those worlds, have them entered into, and understood by others. One of the stories I grew up believing was that I was a very compliant “good” child, quiet, obedient and docile. During this exploration I remembered something different. I wasn’t always so. I was fiery, feisty, curious, stubborn, adventurous and brave. A few memories came up that reminded me that to a large extent those parts of myself were scolded out of me at a very, very young age. Without meaning to my family dis-empowered me. That was an epiphany moment, which brought a great deal of inner healing. It was also a moment of difficult truth telling. My family was loving and not abusive in any way. But in the early 1960’s little girls were supposed to be proper and good, which meant quiet and polite. Couple that with a family culture that was reserved, calm and quiet in general, and a fiery little Aries was going to need to be tamed. As a result those parts of self were disowned and supressed. The next big jolt to who I was came when I started school. While it was nice that I liked to draw and clearly had a talent for both art and writing, imagination, day dreaming, the unseen worlds, and anything more than a tacit belief in “god” was seen as vastly inferior to rational, scientific, masculine ways of thinking and experiencing the world. This was reinforced through my early adult life both in academic settings and oddly enough in church settings where people’s faith had taken a decidedly intellectual turn. Creating these collages gave me a way to tell my story, from my experience and perspective. It gave my soul a way to voice what it held deep inside. This kind of intuitive art making allows you to speak your truest truth without the usual censors that always guard our thoughts. I no longer tell the story that was created for me at a very young age. I tell my own story and in the process heal, and reclaim parts of who I am. I embrace them and love them once more. I have a 20 minute JourneyCircle™ Basics Video you’ll love. 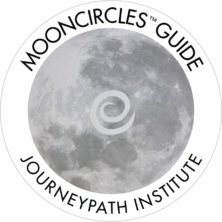 If you’d like to order a JourneyCircles™ Kit you can do so directly from JourneyPath Institute.